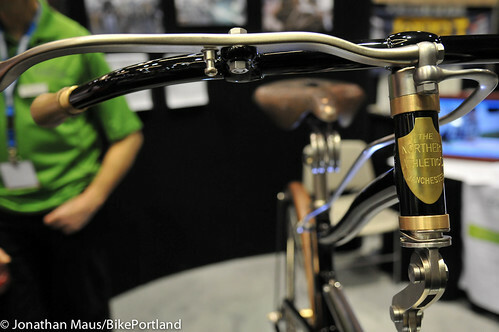 via/ Bike Portland - Tucked away in the corner of the Sacramento Convention Center in a nondescript booth hosted by a Canadian university is a bike that looks like it may have come from another century. 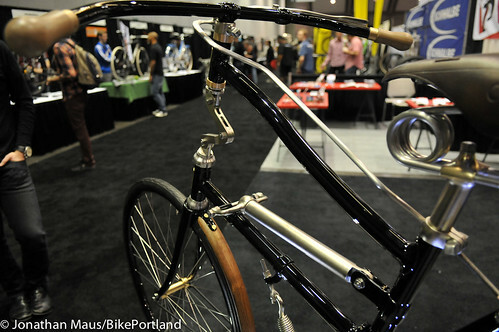 In a convention hall filled with the newest, most innovative bicycle and component designs created by some of the worlds most highly skilled constructors and manufacturers, Paul Brodie's 1888 Whippet replica stands apart at NAHBS as a unique combination of 19th century engineering and 21st century fabrication. At first glance, the bike's slack geometry, upright position, block chain, spoon brake, solid rubber tires and block pedals lend the appearance of a stately machine from the late 1800s. The complex suspension design however, looks to be a contemporary engineer's addition. Despite their precision machined, modern appearance, framebuilder and instructor Paul Brodie faithfully reproduced all of the design features from period line drawings and photographs of an original Whippet housed in a museum. 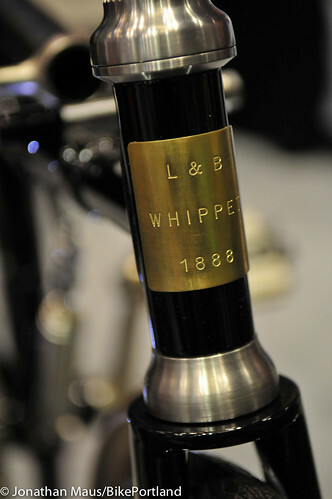 The Whippet's unique, seven-pivot suspension design was engineered in London by C.M. Linley and J. Biggs to compensate for the unforgiving ride of the solid rubber tires that were standard equipment on bicycles of the time. 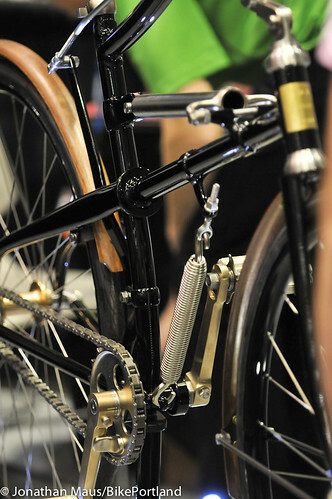 The key feature of Linley and Biggs' design was the rigid front triangle that prevented the rider's contact points - saddle, handlebars and pedals - from moving relative to one another when the suspension operated. By all reports, this innovative system did improve the rider's comfort but the un-damped, single spring design was prone to bobbing under power. Combined with the coil-sprung saddle, the Whippet's extra comfort came with a very bouncy ride! When Dunlop's revolutionary pneumatic tire hit the market in 1889, the Whippet became obsolete and faded into obscurity. A design pioneer himself, Paul Brodie built some of the first Canadian mountain bike frames for Rocky Mountain before he struck out on his own in 1986 and invented the "Vancouver sloping top tube" design. Some riders of the day were slow to embrace the radical design, but its merits eventually won out and nearly every modern mountain bike is built with a compact front triangle. Since then, Brodie has built thousands of bikes in addition his work recreating classic motorcycles. In April of 2010 he signed on to teach a framebuilding class at the University of the Fraser Valley and wanted a project of his own to work on while his students set about building their bicycles. Brodie was attracted to the "really unusual and unique design" of the Whippet when he discovered a line drawing of the bike in a 19th Century book by Archibald Sharp called Bicycles and Tricycles: An Elementary Treatise on Their Design and Construction. "The students were building frames and I wanted to say that I was building something," Brodie says. Construction began in November 2010 and only finished just before this year's show. Imagine tapping 64 precisely placed sets of tiny spoke threads into the round flanges of a hub that you've machined out of a solid piece of bronze. In Brodie's words, "If you break a tap, you will never get it out, it's too small. Best just to take a break and order more bronze." 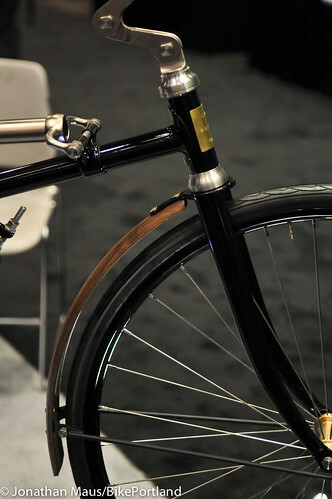 Progress was understandably slow at first, but urgency built and the pace accelerated as NAHBS drew closer. Brodie was forced to put in several 14 hour days to finish in time. "It only got painted last Sunday! I only made the rear hub last Friday!" Altogether, Brodie estimates that he spent about a year and a half working on the Whippet, and the end result is truly a sight to behold. Brodie hopes that his remarkable creation will help bring some attention to his framebuilding class, which is the only one of its kind in Canada and has drawn students from as far away as Germany and Switzerland. In a shift from the closed-shop mentality of the 1980s when "a framebuilder's jig was top-secret," and construction methods were jealously guarded, Brodie is dedicated to imparting his skills and experience to a new generation of framebuilders. "I don't mind sharing information at all. That's basically what we're here for is to share information. Otherwise, when you die, it all goes with you, all that knowledge. What's the point of that?" Still, Brodie says he "Could use a few more students... That's basically why we're down here." Rates for his two-week class are very reasonable and a $300 discount is on offer for students who register at NAHBS. 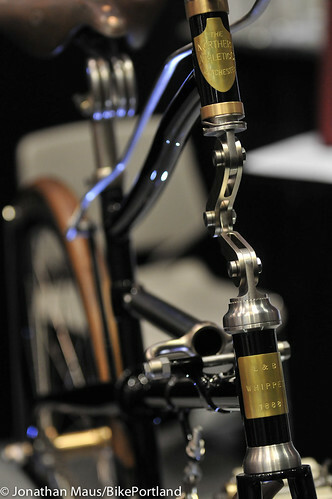 Since Brodie is registered as an educator and not a framebuilder, the Whippet is not eligible for entry into any of the NAHBS awards categories, but is still in the running for the People's Choice award. If you're attending the show in Sacramento, consider giving this remarkable machine your vote. Although boosting enrollment is his primary goal, Brodie admits "it'd be nice to go home with something!" 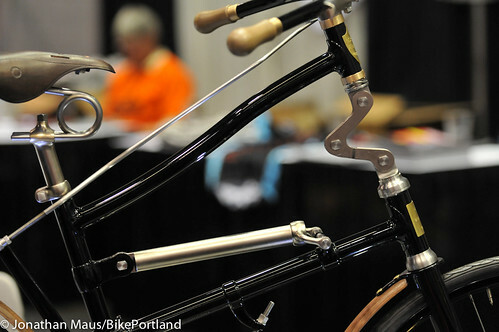 — Learn more about Brodie's framebuilding class here. 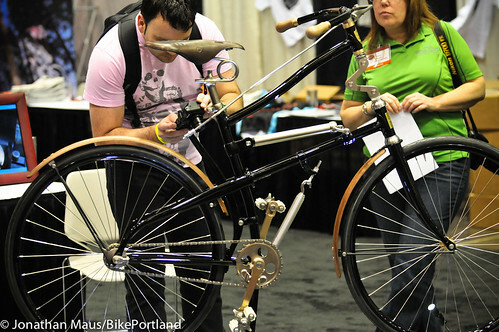 — See photos of the bike that inspired this one and photos of it being built at NSMB.com.